So we had a mask night and tried some of the many masks I’ve gotten but haven’t really managed to try. Omg it’s so cold & I look like Jim Carey! I’ve been under a lot of stress emotionally and physically lately and I can tell my body is so unbalanced right now I need a compass to get right! Do let me know if you have any good tips on how to unwind and stop stressing about things. We tried two masks from two different brands but kind of felt the same results; moisturized & smooth like an operator! Comes in various flavors such as cucumber, watermelon, lemon and so on. The scent is as the name reveals and so yummy one forgets it’s a face mask and not a real eatable! It’s not like the regular sheet masks that covers your entire face rather it’s tiny circles that you place here and there as in wherever you feel needed. You do need to tap the sheets a bit for them to stick and if you’re a person with hairy face it won’t stick so no need trying. 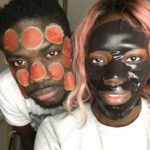 The Kocostar masks are said to give your face a natural glow, rehydration and softer surface and Ous used the watermelon flavored one. 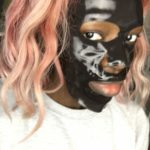 Kiss NY Pro does have a few masks to choose from such as the ones I used (Hydrogel face mask, charcoal powder) or their broad range of face sheets and hydrogel face masks. As most mask theirs also come in various flavors as mentioned above where each flavor has it’s own perks and focus areas. One that I really want to try is the African black soap mask! The hydrogel mask I used is said to have a pore minimizing & purifying effect for your pretty face! It’s a water based gel mask with essential oils and natural extracts. Dermatologically tested, without parabens or artificial colorants. Both masks at supposed to be applied on a clean dry skin for approximately 15-30 minutes but can be used as a overnight mask as well. My favorite amongst the two types is the full face masks as I don’t like sticky things and applying the slice sheets seems a bit trickier than the face mask which only consists of two pieces whilst the slice sheets has twelve smaller pieces. It also feels like the face masks gets all of your face however the slice sheets allows you to only “mask where you need it” and is preferable if you want to double mask (use different type of masks for individual trouble areas). Well. To buy the masks please click here for masks from Kiss NY Pro or click here for masks from Kocostar. If you do buy any and tries them, please let me know what you think by sending me a dm on Instagram. You’ll find me there as iamayshajones.